Hello Everyone! I’m back with my day 7 and 8 of the coloring challenge. I had every intention of fitting in at least 5 minutes yesterday to color and truth be told, it didn’t happen. I just had a really full day of appointments and then we went as a family yesterday afternoon to go pick out Apollo’s new glasses. By the time we got home, ate dinner, picked out clothes for the next day, I fell into bed. This is all I got done yesterday – just stamped the image. 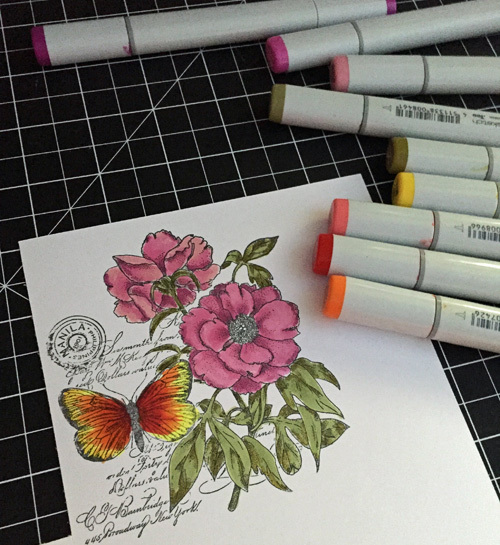 This stamp is called Botanical Notes by Penny Black. I have had it longer than I would like to tell and just broke the seal to try it out. 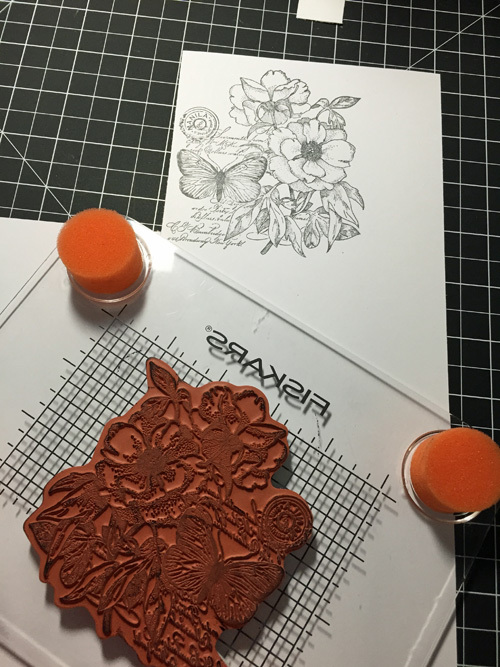 I see so many possibilities with it and can’t wait to try them with this stamp. It’s a good size stamp too. Tonight I was determined to get back on the bus and color. Sometimes when I fall off, I don’t return for a long while but having a challenge with others and posting them on the blog and my Instagram, helps to keep me on track. I would like to play more with the butterflies coloring. I definitely will be using this stamp more. This challenge is not only helping me commit to improving my craft but also to open all the stamps I have been hoarding for some time now. Very excited for the possibilities. OMG, it came out beautiful. I am so impressed with how you colored it! Thanks Ashley. It’s hard for me to be objective about my coloring. Sometimes I spend more time criticizing it than finding the good stuff. So it really nice to read your kind words.